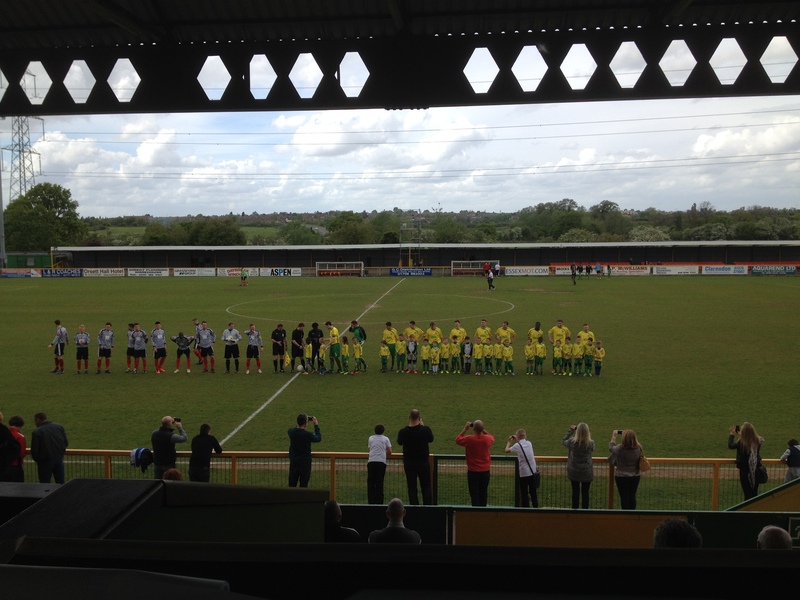 Thurrock miss out on the last play-off spot due to a 2-1 defeat to local rivals Tilbury and as Needham Market won 7-1 leap-frogged Thurrock and take fifth spot. A spectacular opening goal from Piers Wixon and a Danny Aldwinckle strike was enough to spoil the party for Thurrock despite a late goal by Rob Gilman. The home side will now have to pick themselves up and go again next season after breaking their six game unbeaten run and finishing sixth with Tilbury ending the season 16th. The visitors had the first half chance of the match five minutes in as Joe Christou snap shot was wide of the target. The home side had their first opening 19 minutes in as Kurk Smith switched the play to Dave Knight who shot on the half volley but straight at James Marable. A minute before half-time Kurk Smith burst down the left to put a low ball across for Ross Wall but could not get there before the keeper. The best chance of the half fell to Thurrock’s top goal scorer Knight who was played in by Kurk Smith into space on the left and his shot was tame and comfortable for James Marable. It was a moment of brilliance from Tilbury four minutes into the half as Piers Wixon hit a volley from a tight angle on the edge of the box which headed straight into the top corner for the away side. The home side nearly got the vital goal they need through Mark Oneyamah shot which was just tipped over by James Marable. David Knight had a chance to equalise with just under 15 minutes to play as he was in on goal but for a great save by Marable to deny Thurrock. Thurrock had a glorious chance with 12 minutes to go to get on level terms as Ross Wall climbed above his marker to head on goal but was palmed away again by in form James Marable. Tilbury doubled their lead in the 83rd minute as substitute Danny Aldwinkle was given space and cut inside and slotted his shot under Andy Walker. Thurrock grabbed a goal back with five minutes to play as captain Rob Gilman bundled the ball into the goal from a Mark Oneymah cross. 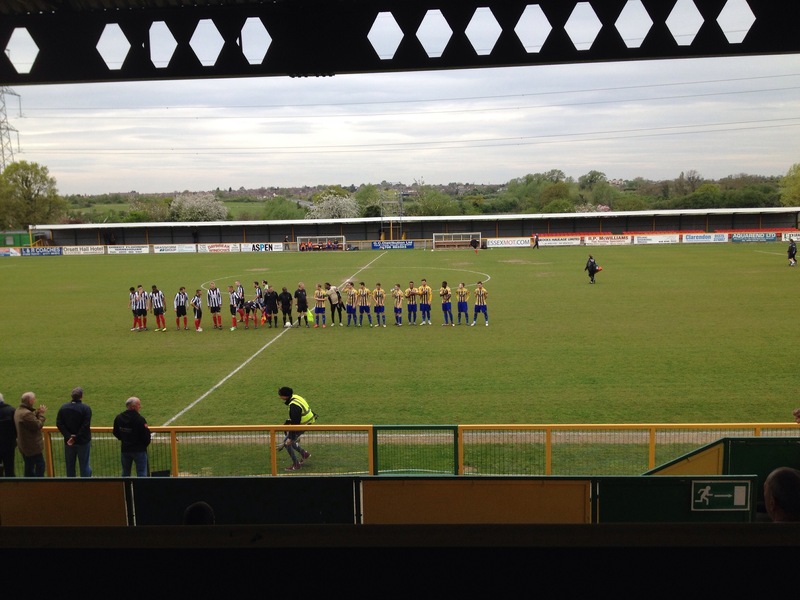 The visitors absorbed the late pressure by Thurrock to take the three points back down the A13. This entry was posted in Football, Sport and tagged James Marable, Kurk Smith, Piers Wixon, Rob Gilman., Ryman League, Ryman League North, Thurrock FC, Tilbury FC. The Lakeside Vortex Hammers won 55-41 on the Good Friday double header against Eastbourne Eagles and claim another three points. The “Hammers” now make it four consecutive home victories and continue their 100% home record and maintain top spot in the Elite League. The home side got off to a great start with experienced Peter Karlsson as he won heat one occupied in second by Mikkel Bech to take second and take a 5-1. Heat two was squared as young Adam Ellis had a dropped chain on lap two as Southend star Ben Morely won the heat with heat three also being levelled as captain Dave Watt won. Adam Ellis crashed in heat four as Daniel Halsey caused Ellis to fall and collide with the barrier but Ellis brushed himself down and raced in the re-run to take a point with Richard Lawson’s heat win. In heat five “The Hammers” extended their lead as Karlsson won another heat with Lewis Bridger in second to put the home side 20-10 in front. The visitors took advantage of the tactical ride in heat six as Cameron Woodward won the heat with Watt and Lawson coming in 2nd and 3rd giving “The Eagles” a 6-3 heat win. Bech and Watt claim heat wins in seven and eight to take both heats 4-2 and push out to a 31-20 lead. The home side had the meeting virtually wrapped up after heat nine and ten both with 5-1 wins as Ellis restored his confidence as he won his heat and Karlsson again won the next, stretching the lead to 41-22. Although the visitors again used the tactical ride well taking an 8-1 in heat 11 as Bjarne Pedersen and Mikkel Michelsen took 1st and 2nd. Bech was in superb form as he won heat 12 to split the heat 3-3 and left the meeting to be whisked off to Denmark to race later that evening. Lakeside Hammers clinched the victory in heat 13 with another 5-1 from Karlsson supported by Bridger making the score 50-34. The away side took the final two heats as Michelsen won heat 14 but Lawson and Morely squared the heat. The final heat was won by Pedersen and Woodward to claim a consolation 4-2 and end the meeting at 55-41. Lakeside Hammers travelled down to Eastbourne that evening without Mikkel Bech but took a valuable point despite Eastbourne who won 48-42. The Lakeside Hammers next fixture is at home next Friday evening to Swindon Robins at Arena Essex. This entry was posted in Sport and tagged Eastbourne Eagles, Elite League, Lakeside Hammers, Speedway. 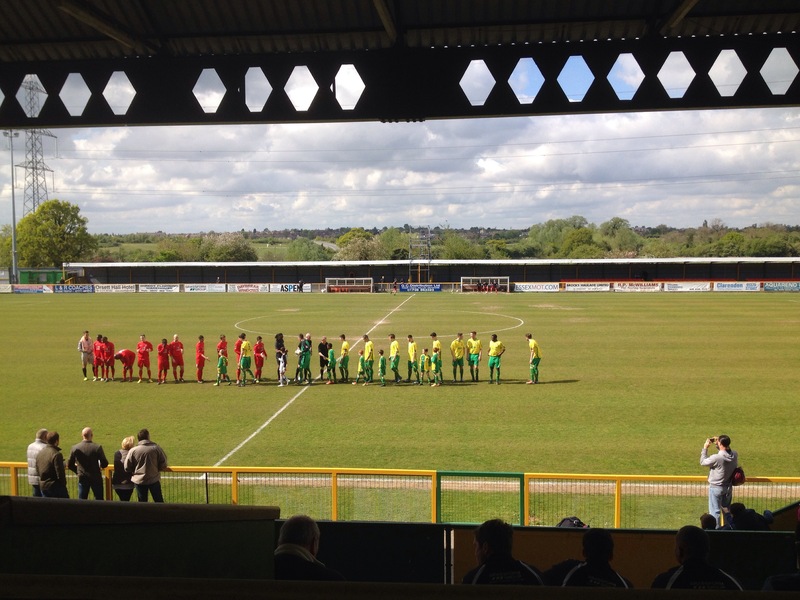 Thurrock continue their play-off push as they more to one point off Needham Market with a 2-1 home win over local side Redbridge. A first half goal from Ross Wall and second half goal from Charlie Stimson was enough to claim all three points, despite Daniel Francis getting a goal back for Redbridge. Redbridge had the better of the possession in the first 15 minutes with neither side causing either keeper to make a save. The home side had the first clear cut chance as Kurt Smith headed the ball over the defence to Remi Sutton who had a clear shot on goal but scuffed his volley wide 22 minutes in. Thurrock continued to press with Charlie Stimson as he teed up a shot for Ross Wall to strike from 25 yards but for a great save down low to his right, Dean Driscoll denied the hosts. Thurrock broke the deadlock 24 minutes in as Remi Sutton dinked the ball back in the box from a corner to an unmarked Ross Wall who fired home from close range. The home side looked uncomfortable on the ball until the goal but after that settled down and began to look more confident on the ball. In the second half Sutton almost doubled their lead as he intercepted the ball in his own half, advanced down the left and played a one two with Stimson but his shot was tame. Thurrock grabbed a second nine minutes into the second half as Mark Onyemah was given time for a shot on goal which was saved but Wall was alert to the loose ball and shot for Stimson to poke home. Redbridge felt the goal should not have stood as Stimson had to be offside to tap in from literally the goal line but the goal stood. The visitors put their frustration to good use as Daniel Francis got one back for Redbridge seven minutes later after he slotted in a rebounded shot from a tight angle. Bradbury stung the hands of Andy Walker five minutes from time as they were in search of their equaliser. Thurrock held on in the closing stages to take the victory and make it four consecutive wins and look in good form with a vital game in hand which could be the difference if they take the final play-off spot. This entry was posted in Football, Sport and tagged Charlie Stimson, Daniel Francis, Kurt Smith, Redbridge FC, Remi Sutton, Ross Wall, Ryman League North, Thurrock FC. Heybridge Swifts continue their good run of form as they got an important 3-1 away victory against 9-man Romford to maintain their push for automatic promotion. Michael Toner opened the scoring early in the first half and set them on their way despite Nick Reynolds equaliser early in the second half. Ben Newson grabbed a brace with both goals in the second half to claim all three points and stay in amongst the top six sides. Romford had two men sent off late on with Danny Jones being sent off for a second yellow and Matt Toms given a straight red moments from the end. The game was lively from both sides in opening few minutes but Romford got a great chance on the edge of the box nine minutes in to threaten the Heybridge goal. The free-kick broke down and the visitors went on the counter and after poor defending the ball fell to Michael Toner to strike which went through the legs of the defender and into the bottom left corner. The home side could have equalised nine minutes later as Nick Reynolds was put in on goal from a flick on from Ryan Imbert but could not keep his shot on target. Romford responded in the second half and grabbed a deserved equaliser as Danny Jones burst into the box and dinked the ball across goal for Nick Reynolds to guide his header past Ashley Harrison. The game only stayed level for three minutes as Ben Newson took advantage of Romford’s lacklustre defending and slotted his shot past Atu Ngoy to take the lead. The fourth goal which decided the match came eight minutes from the end with another ball not cleared and Newson capitalised as he homed in on goal and placed his shot in to the bottom right corner. Romford’s day went from bad to worse as Jones got a second yellow for retaliation two minutes from time. Matt Toms also went on his way in stoppage time with a straight red which looked to only be a yellow for a tuck in the centre circle. Romford look set for a mid-table finish as they stay 11th in the table while Heybridge stick in the mix in 4th with only a few games remaining. This entry was posted in Football, Sport and tagged Ben Newson, Danny Jones, Heybridge, Heybridge Swifts, Nick Reynolds, Romford FC, Ryman League. The University of East London football side gained one point after UEL 2nds won 2-1 against one of the Middlesex sides but the other side disappointingly lost 5-1 to equal the points out in the football. UEL were looking to take both points from Middlesex and cement their dominance overall but that was not the case. The opening ten minutes for UEL 1sts was a bit tense for both sides knowing what was at stake, but the visitors had the first chance of the game as Vendal Vunes’ poor back pass put the Middlesex striker in on goal but Dan Robinson made a fine save to deny the striker. Again the warning signs were there for the home side as the striker got in again but for Robinson to palm away the initial shot and the follow up went into the side netting fortunately for UEL. It was just before the half hour mark before UEL got their first chance of the match as Lamin Bah’s corner was headed away to Stefan Neilson whose shot was tame and comfortable for the keeper. Only five minutes before the break and UEL nearly got the opener after Bah’s corner was met by Richard Johnson but was cleared off the line by the defender. The counter attack from the resulting corner saw the away side take the lead as UEL could not get back and the Middlesex striker explored the space down the right. The first shot was saved well again by Robinson but could not do anything about the follow up by his partnering striker to slot it home. It was not long in to the second half when Middlesex doubled their lead as the strike force scored again as the front man beat Osei-Bonsu down the left side cut the ball across goal and tapped in from close range. UEL could not deal with the front men as they continued to torment the back four to add a third three minutes later. With a simple ball in between the two defenders saw the striker in on goal and slotted it calmly past Robinson. Vunes looked to get UEL back in the game as he went on a mazy run taking on player after player and got a break in on goal but the keeper made an excellent save to deny UEL a glimmer of hope. Middlesex extended their lead to four with less than 20 minutes to go as one pass cut the defence in half again and the striker grabbed his second placing it passed Robinson. Vendal Vunes grabbed a consolation ten minutes from time as he cut inside passed his marker and lashed a shot into the near post leaving the keeper no chance. Middlesex restored their four goal cushion two minutes from time, from the right hand side the striker was looking for him hat-trick but Robinson denied it but could not keep hold of the shot and was again tapped in to complete the rout. Despite UEL’s poor performance it was counteracted by the 2nd side winning 2-1 to restore the balance in the Varsity series. This entry was posted in Football, Sport and tagged Middlesex, UEL, Varsity Cup.